If you're planning a trip to Punta Cana, printing a road map of Higuey is a good idea. Higuey is an easy outing just because of its proximity to the hotels. Knowing where you are when you look at the street signs is comforting. To print, click on the graphic and a much larger (black and white) version of the map to your right will appear. Printing that page and bringing it with you will make your visit to Higuey a little easier! The main historical element to see in Higuey is the Cathedral and the church of San Dionisio. The church was built by the Spaniards in the 15th century and housed the famous painting of the Virgin of la Altagracia. The painting was later moved when the Cathedral was built. Every year on the "Virgin of la Altagracia Day" in late January, tens of thousands of visitors make the pilgrimage to the cathedral. 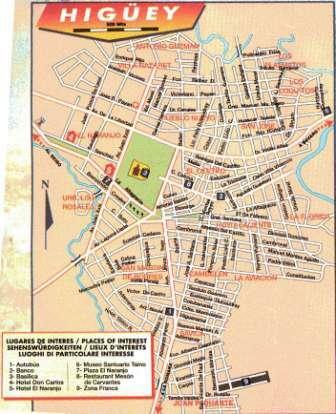 Here are some other useful maps of Punta Cana and the surrounding area. Click on the thumbnail images to see the full size versions of the maps.